Sit, Down, Stay, Heel, Come, Place Training (Go To), Retrieving, Tricks...Fun! Your Dog's place in the household. You are in charge! For Veterinary exams & grooming. Common behavior problems such as house soiling, biting, digging, chewing, etc. Settle Down, Off & good greeting behavior. Steady, (not to pull on leash); Wait, (not to rush outdoors); Stay within yard boundaries. A combination of experience, energy and humor creates a joyful environment for dog and puppy training that is productive and great fun. 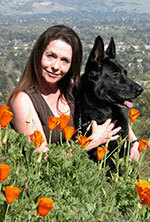 For many years "Laura for Dogs" has stood out as one of the best in the dog and puppy training field. 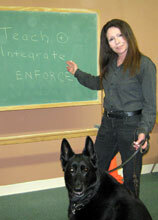 Your family and your pet will learn long term training and coping skills. Laura demonstrates the ease and naturalness of the dog training process and you will experience the sheer fun of her training methods. A pioneer in the Puppy Training industry, Laura Enos has been teaching owners how to raise and train their puppies since 1982. In that time she estimates that she has handled well over 38,000 dogs! The style of training she has developed over the years incorporates many influences.